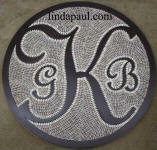 Falling Leaves Medallion 24" x 24" Designed by artist Linda Paul. 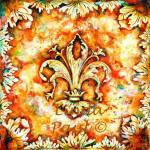 Also has matching leaf accent tiles. 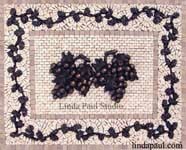 Double Grape Mosaic Tile Medallion custom sizes too $1399.00. 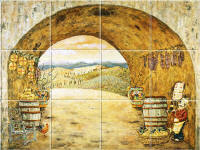 Florida tile mural backsplash and decorative accent tiles of a window view of the beach with ocean waves, palm tree, and sunset. 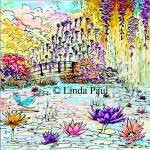 Perfect for tropical and beach house decor. 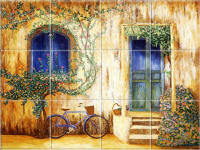 The Olive Garden Window with olive oil, olive branch, black olives, sunflowers and a hummingbird. 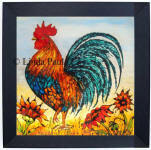 Rooster backsplash Buy as individual framed or unframed tiles or as tile mural. 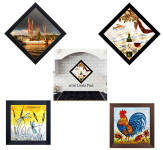 The framed tiles can be hung as a temporary removable backsplash or just as great framed wall art. 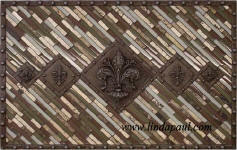 Buy kitchen backsplash mosaic tile medallions, metal tiles, accents and tile murals for behind stove and sink areas. 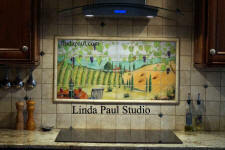 Kitchen backsplashes of wine, vineyards, grapes, sunflowers etc. 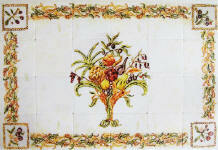 Prices start at $399.00 and up for backsplashes and $16 for decorative accents and tile borders. 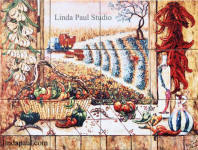 Tile murals are designed and created by artist Linda Paul in her Colorado studio. 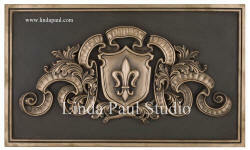 They are beautiful and durable!